The great room is a great place to relax and play games Chess board on table and more games in the cabinets Private hot tub on the back balcony Amazing views Front entrance to the condo Double heated garage Relax by the gorgeous gas fireplace in the great room 50 Slopside Whitefish Mountain Base Lodge Aerial The Great Room Living room has flatscreen TV Cozy Sofa, Leather Chairs and Ottomans in the great room Slopeside at Whitefish Mountain Aerial Cozy leather sofa and chairs in the living room Gorgeous Granite Countertops in the Kitchen Stainless Steel Appliances 4 Seats at the granite island Large windows that provide ample light and great views Master Suite has King Size Bed Master Suite has gas fireplace, flatscreen TV and Private Balcony View from a Slopeside Master Suite Balcony Master Suite Bathroom - Stand up Tile Shower and large tub Master Suite Bathroom - His & Hers sinks and private room with toilet Large Bunk Room has 2 Queen Size Bunks and 1 Twin Size Bunk - Sleeps 10 Bunk Room has Flatscreen TV, Chairs to Relax and Private Balcony Bedroom 1 has Queen Size Bed and Private Deck Bedroom 1 has large closet and a private full bathroom with double sinks, shower and tub Bedroom 2 has Queen Size Bed and Flatscreen TV Bedroom 2 has large closet space and a Private Bathroomw with a Stand-up shower, Toilet and Sink Laundry Room has washer & dryer for your use Slopeside Entrance Aerial shot of Whitefish mountain World class skiing in Whitefish Slopeside Whitefish Montana Aerial Enjoy the great shopping and restaurants in downtown Whitefish Enjoy a summer chairlift ride Take in all the views Montana has to offer. This ski-in ski-out unit is at the very best location on the mountain and is in the heart of one of Montana’s finest ski resorts. 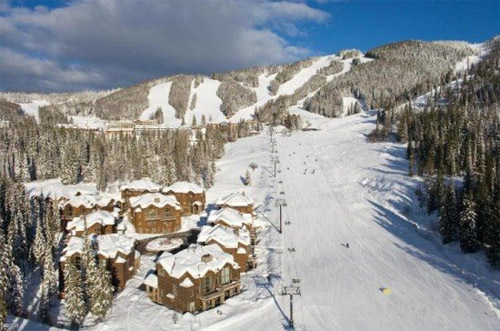 Just steps away is the Base Lodge that links you to 3000 acres (98 trails) where you can enjoy some world-class skiing. The resort is well known for a pleasant lack of lift lines and for its consistently good snow conditions, on average 300 inches a year! This unit is just a 35-minute drive to the west entrance of Glacier National Park!! A 7-minute drive away is beautiful historic Downtown Whitefish. If you enjoy shopping, great food and a fun nightlife this is the place for you! There are many Clothing, Souvenir and Antique shops for you to relish in. Take pleasure in some of the finest restaurants that the Flathead Valley has to offer! 4 floors, 3574 square feet of living space packed with all the comforts of home. Cathedral ceilings, large windows for ample light and spectacular views plus there is no extra charge for the fresh mountain air. The floor plan is open and inviting. Gourmet kitchen with Viking commercial grade appliances and large dining room table. Finely-appointed living room with gas fireplace and comfortable TV area with large flat 50” HD TV. There is a half-bath on this level along with a large balcony off of the great room and propane BBQ. The upper level has a luxurious Master Bedroom with a King-size bed, gas fireplace and a private balcony with french doors to enjoy the views. There is a private elegant master bath with a large bathtub, tile shower and his and hers sinks. On the lower level are two guest rooms each with queen-size beds, private baths, TV’s and private patios. All the bedrooms have luxurious linens. The patio has a private hot tub to enjoy after a long day on the slopes! Roomy and comfortable bed bunk room with HD TV, private bath and balcony, perfect for the kids. There is a laundry room with full-size washer and dryer. The property has a two-car garage with an additional two parking spots in front of the garage as well. You owe it to yourself to stay at this stunning Slopeside unit. Great place to stay with a large group and children. The ease of getting the property rented for our event. The property was excellent. It exceeded our expectations. The close proximity to not only the resort facility but also Glacier National Park and to the town of Whitefish. Also the airport.